(CNN) – Former House Speaker Newt Gingrich's thumbs have been busy. On Thursday, he will unveil the new version of 1994's "Contract with America" in Des Moines. The revamped "commitment," named the "21st Century Contract with America," is said to have been composed on the 2012 candidate's Blackberry in the memo section, using his thumbs. The Des Moines Register received a preview of the document, which will be formally unveiled Thursday during a town hall meeting in the capital city of Iowa, the first-in-the-nation caucus state, where a poll out this week indicated that Gingrich was fifth in the race for the GOP presidential nomination. Gingrich's spokesperson, RC Hammond, told the paper that the policy wonk typed the contract as ideas came to him, and that it represents the "beginning of a conversation" that won't be finished for another year-a slow roll-out that coincides with ongoing presidential campaigning. "It's more of an open letter," Hammond said. According to the Des Moines Register, Gingrich's letter to America outlines methods to "change the trajectory of America" with reforms of Medicare, taxes, and Social Security that amount to a series of choices. In a two-pronged tax structure, Americans could continue to pay income tax in its current form, or choose a flat tax rate. Similarly, senior citizens can keep Medicare as-is or they could choose their own health insurance provider and get help from the federal government to pay for premiums. When it comes to Social Security, Gingrich proposes that younger citizens currently paying into the system should have the option to put some of their contributions into personal savings accounts. And he jumped from walking back on his criticism of House Budget Chair Paul Ryan's Medicare plan in May to endorsing it four months later. Though he once criticized the plan to overhaul the system into a voucher program that would allow seniors and disabled to purchase private health insurance as "social engineering" that amounted to a "radical change," in the contract Gingrich says he now approves of turning Medicaid over to the states. The candidate offered a mea culpa to the Wisconsin congressman in the spring after receiving stinging criticism from his party. Gingrich also includes a plan to balance the budget (raise revenue through the development of federally owned land in states including Alaska and Nevada) and stem illegal immigration (control the border by moving half the staff of the Department of Homeland Security in Washington, D.C. to the borders in Texas, Mexico, and Arizona). But don't make the mistake of calling this contract a pledge. Hammond insisted, "A pledge is something you're going to try to do. With a contract, you're obligated. This is what you commit to." Are you still here, Newt? Why? 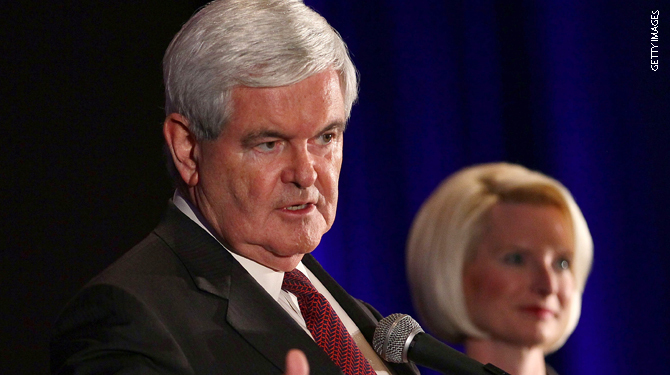 Newt is a great ideas guy and very forward looking. Bill Clinton took a lot of credit for what Newt was responsible for in the 90's. If Fox News was around then, Clinton, the Democrats and the liberal MSM never would have gotten away with smearing Newt and the Republicans like they did. THANK GOD the liberals don't control ALL of the media now and Fox News is the LEADER in cable news! !